We highlighted Squad's arrival on Greenlight just over a week ago, and it's already made it through the publicity gauntlet. That's exciting news for full spectrum combined arms warfare aficionados. 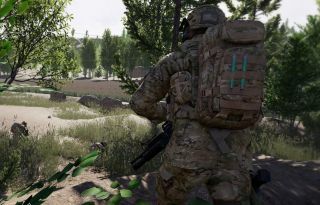 Squad is a commercial effort from the makers of the lauded Battlefield 2 Project Reality mod, and its scale and devotion to military realism could make it a good competitor for Battlefield fans that have moved away from the series (or feel that the series has moved away from them). Squads of nine form groups of up to 50 soldiers and take on equal numbers in huge areas, rendered using Unreal Engine 4. "High levels of teamwork and communication are crucial to success." "On behalf of the entire team we thank you all who have voted us, and being part of the excitement that helped get Squad Greenlit" the team says on Squad's Greenlight page. Further updates are promised on the Squad site.